It's been several whirlwind weeks since I last posted and now, a new year is already upon us! By the way, happy new year to all! Shortly before Thanksgiving last year, I accompanied my boss on a short trip to Las Vegas to attend a convention. While it was mostly for business, we were able to sneak in one day of leisure. 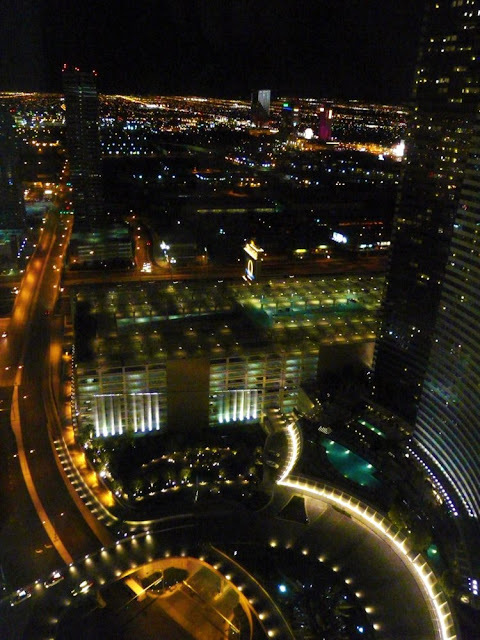 We chose to stay close to the Aria Resort and Casino where we were staying at and just spent our time eating and walking around. 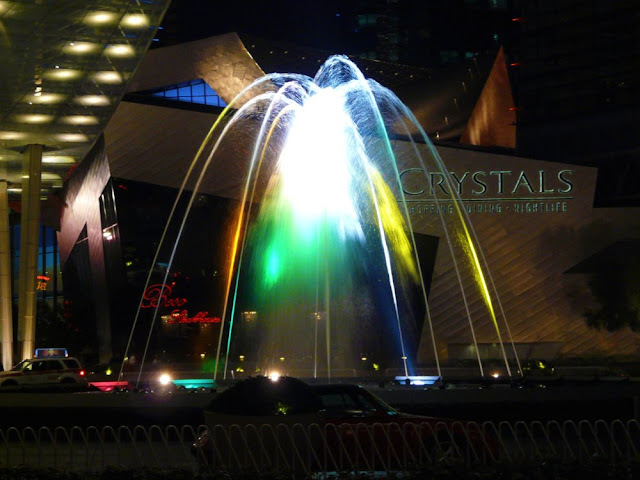 The fountain outside the Aria. 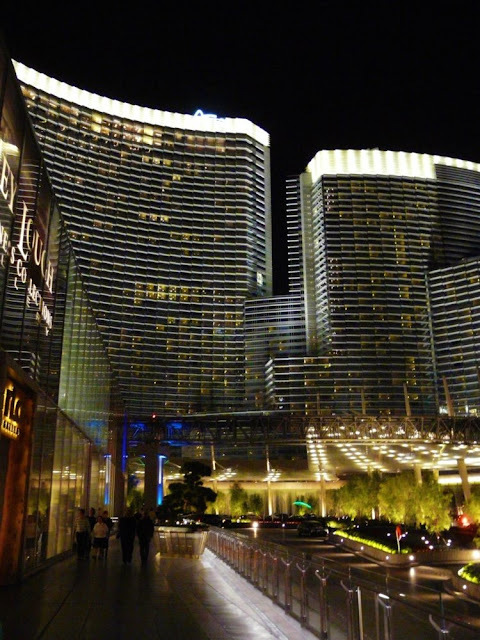 I didn't know what to expect of the Aria hotel since it's been several years since I'd been back to Vegas but upon checking in, all I could think of was WOW! 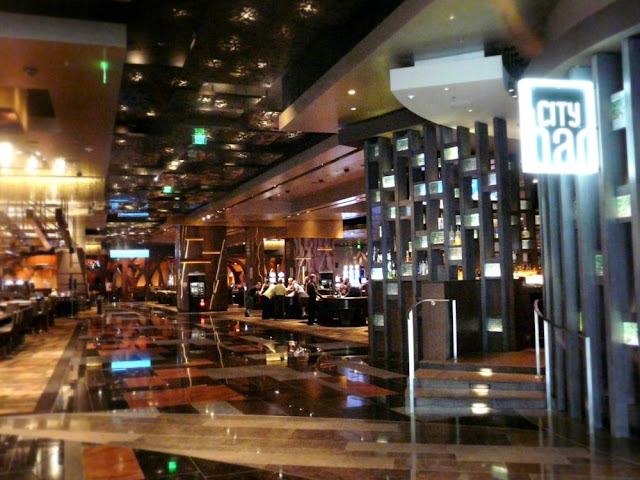 It's a newer casino (just two years old) located right smack in the middle of the Las Vegas strip at City Center and has a modern and luxurious feel to it. 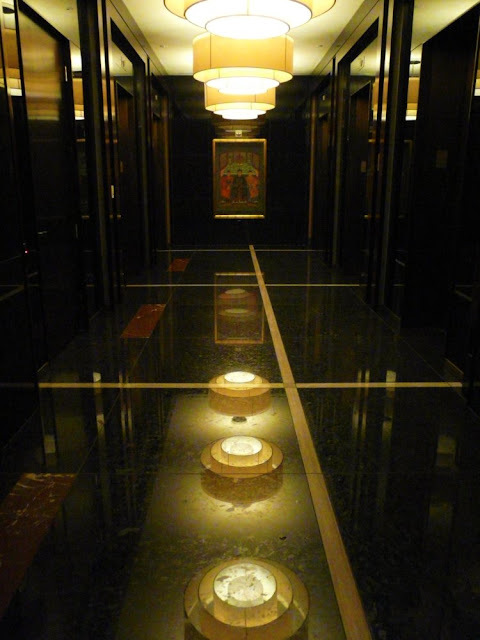 Our room on the 50-ish floor. Upon entering the room for the first time, the high tech curtains automatically began pulling back to reveal the breathtaking view to us. 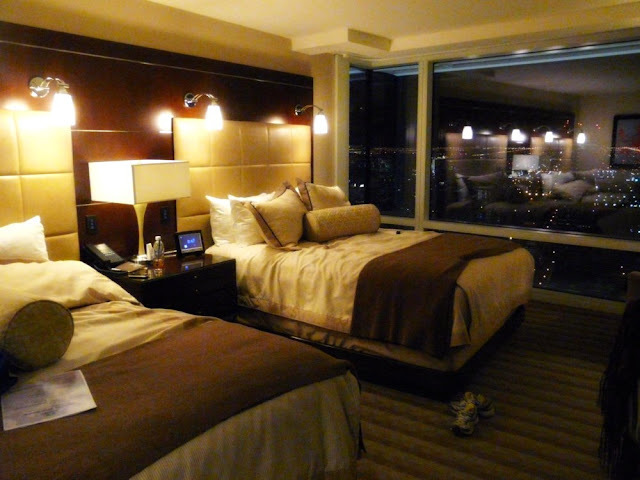 Everything in the room is automated and controlled via the bedside touchscreen clock radio and through the TV interface. Neat-o! The gorgeous view from our room. 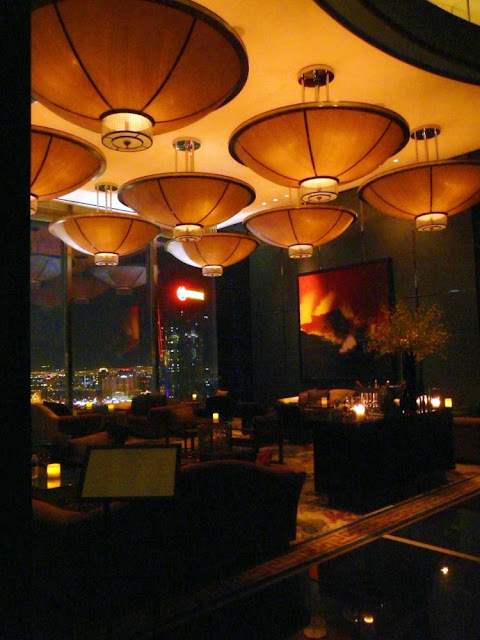 Aria's hip, stylish and modern decor. 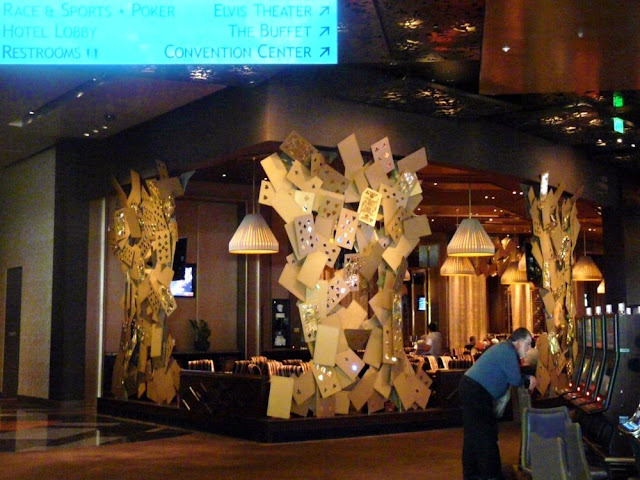 I particularly loved the artistic touches scattered throughout the hotel and casino. 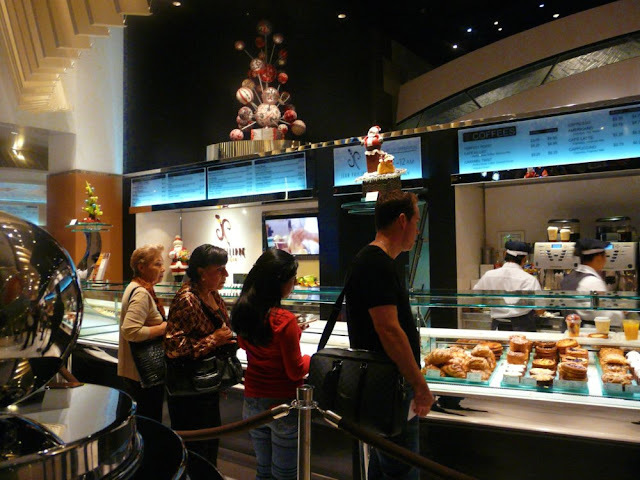 Grabbing a quick breakfast bite at their coffee and pastry bar. 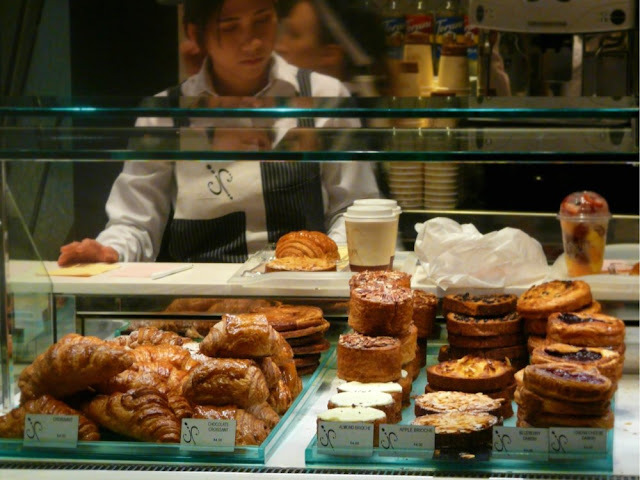 They had all kinds of pastries for sale such as cakes, tarts, croissants, brioches, cupcakes and muffins. Each cost $4 but were fairly large in size. And c'mon, this is Vegas. 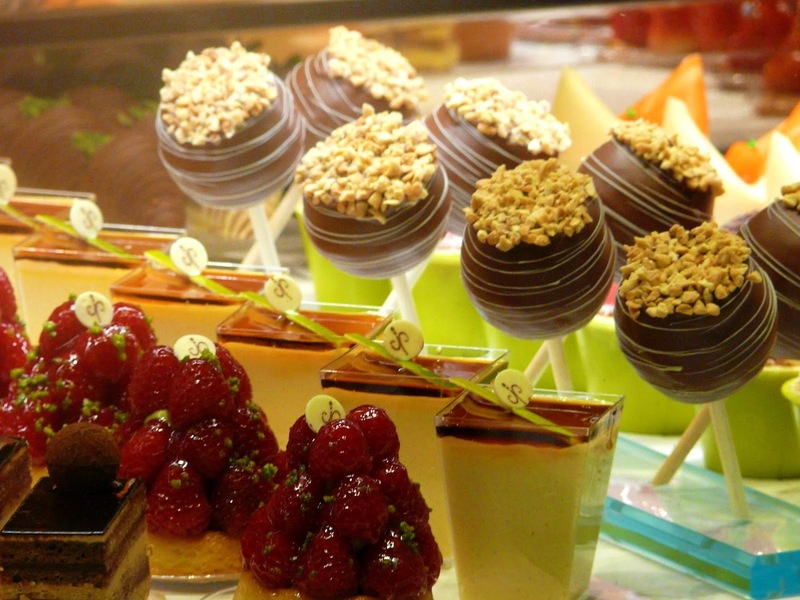 More colorful pastries...a feast for the eyes as well as the palate. 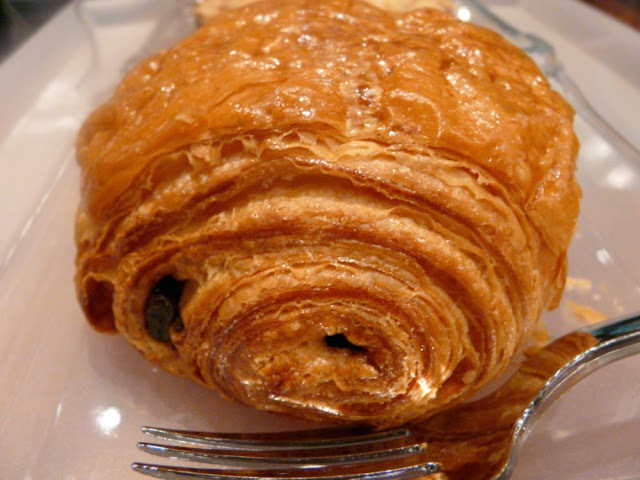 I had a chocolate croissant and it was delish -- flaky and buttery, just like the ones I had in Europe. 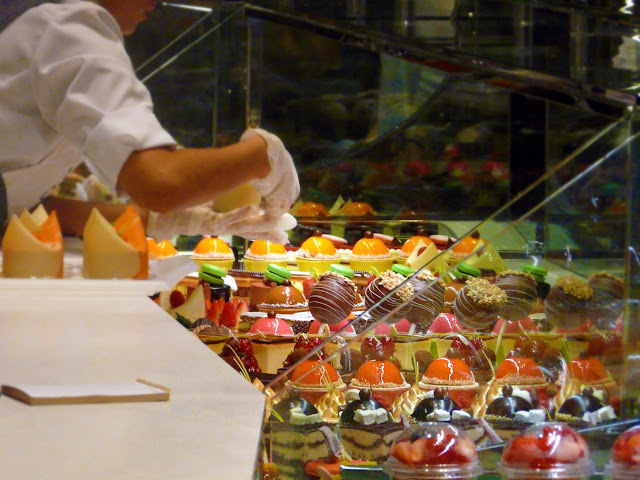 Delectable looking food art. None of these are edible but they sure look good enough to eat! This one's edible though. A life-sized ladies pump made entirely out of chocolate and cost about $50 each. 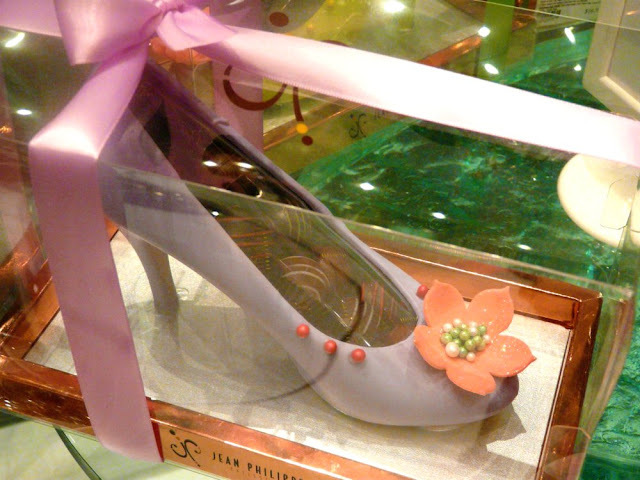 The shoe itself is molded out of white chocolate and then hand painted and decorated, after which it is filled with chocolate truffles. Cinderella would not have liked to have lost this shoe! 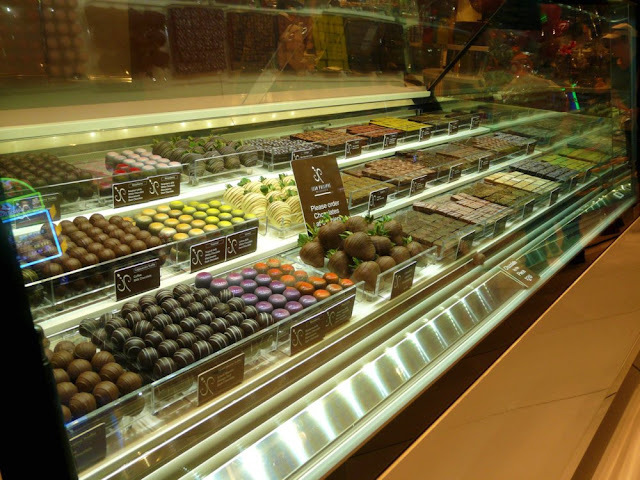 Assorted gourmet chocolates for sale. 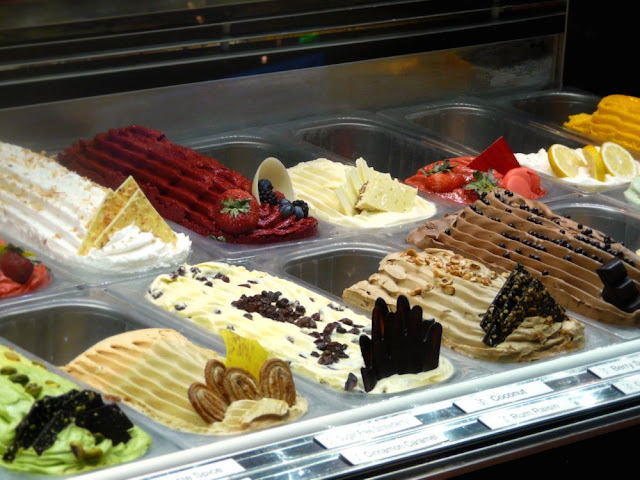 And a variety of gelato for sale. 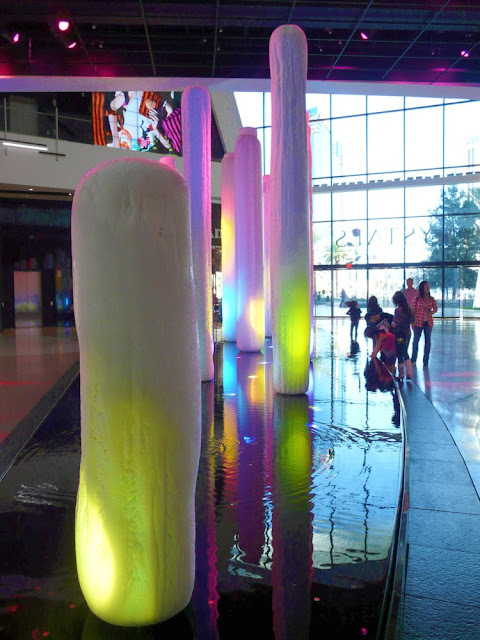 The Aria had this cool water wall located right outside. Not only was it interesting to look at but it also emitted a calming "whooshing" sound every time the water came down. I want one for my backyard...you know, when I hit the lotto someday. 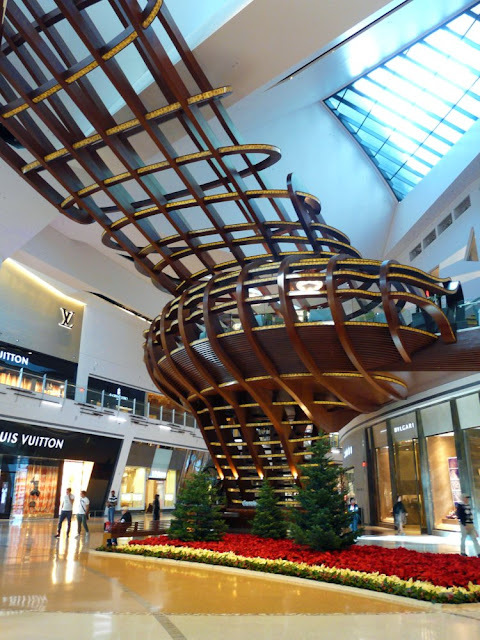 We walked through the luxurious Crystals shopping mall located right next to Aria. They had interesting displays such as this one made of large, colorful "icebergs". Yes, each pillar is a hard block of ice. Pretty cool! I loved this display in particular and so did all the kiddies. 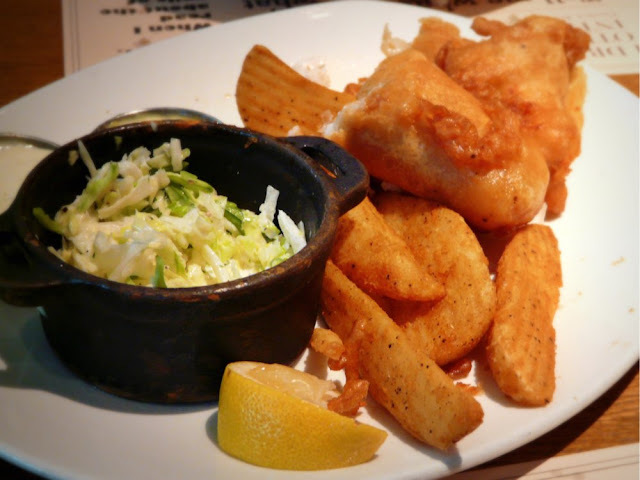 For lunch, we stopped by the Todd English pub and restaurant located outside the Crystals mall for some fish and chips. Typical pub memorabilia on the walls. 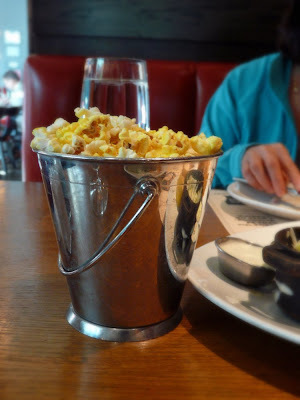 Popcorn bucket for snacking on. our surprise and the decor was classy and romatic. 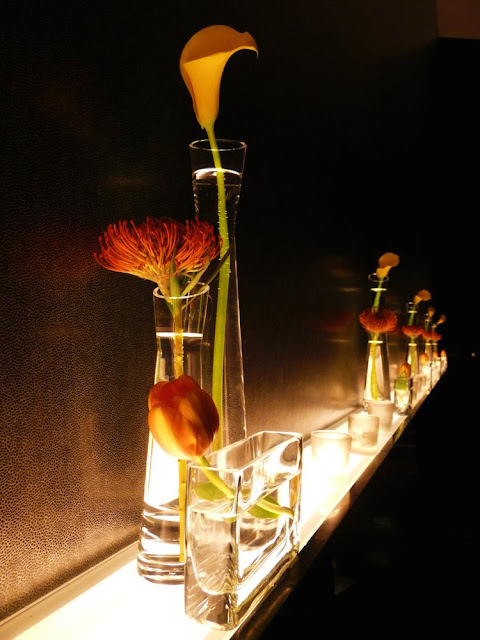 with these pretty floral arrangements. 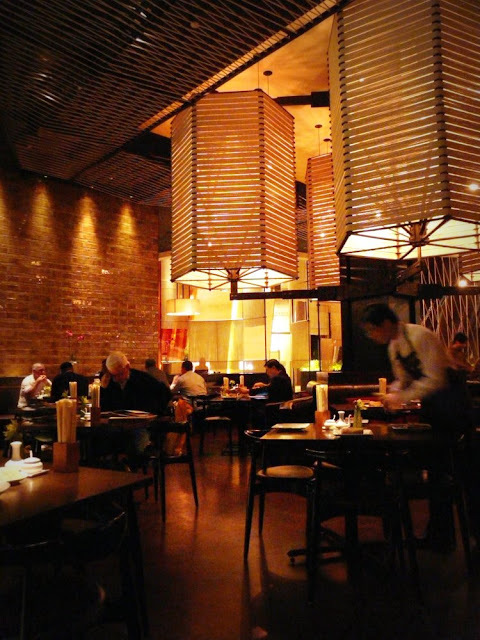 At the end of the day, we were craving something Asian and found the Lemongrass restaurant within the Aria. 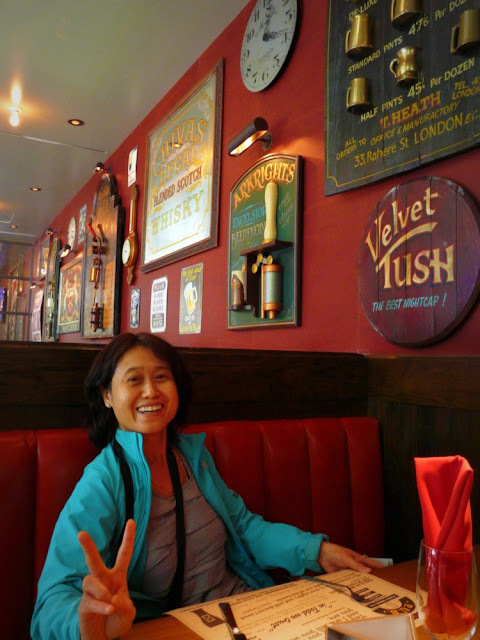 It was described as a Thai restaurant but upon reading the menu, it appeared to be more of a general Asian eatery as it offered Singaporean, Malaysian, Japanese, Chinese and Taiwanese cuisine as well. Check out their menu. I liked their cute centerpiece, made of pebbles and assorted succulents. 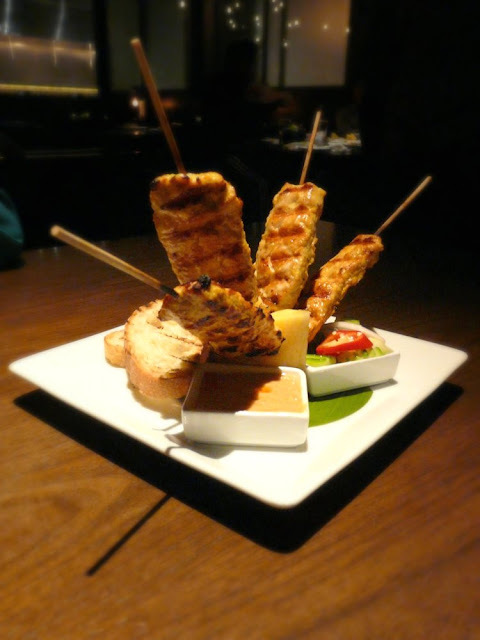 We had their chicken satay as our appetizer. The sauce was great and the satay sticks weren't too bad. Nothing out of the ordinary, aside from its interesting presentation. 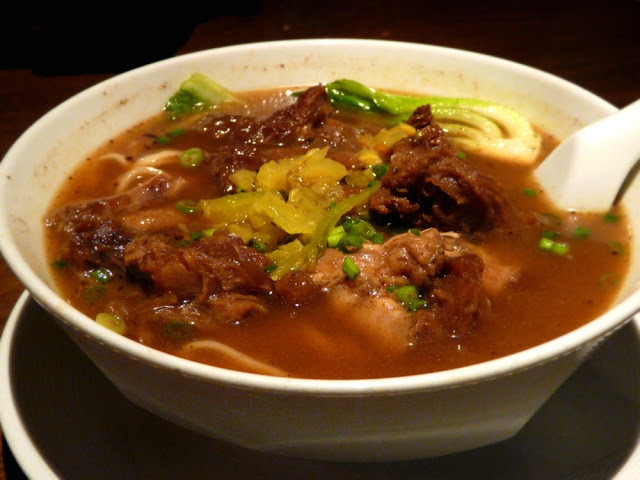 My boss' dish - Szechuan Beef Noodle Soup. I tasted some of it and was surprised at how good this dish was. The broth was wonderful and full of flavor. The beef chunks were soft and tender. 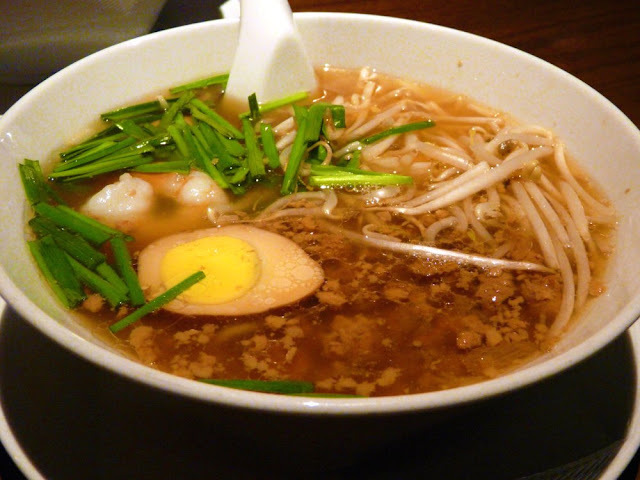 I ordered their Tainan noodles which had stewed ground pork, stewed egg, shrimp, bean sprouts and Chinese chives. The shrimp were fresh and crunchy and the broth was also very flavorful. 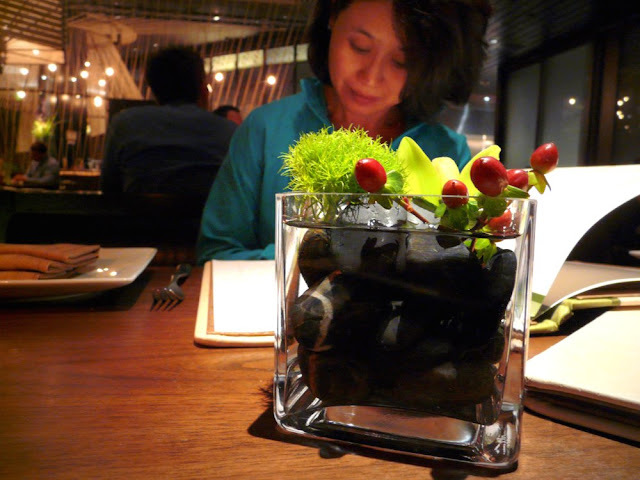 For the kind of restaurant it was (trendy, located inside a luxurious hotel and somewhat expensive), I wasn't expecting much of their food to be honest but it proved to be a great dining experience overall. 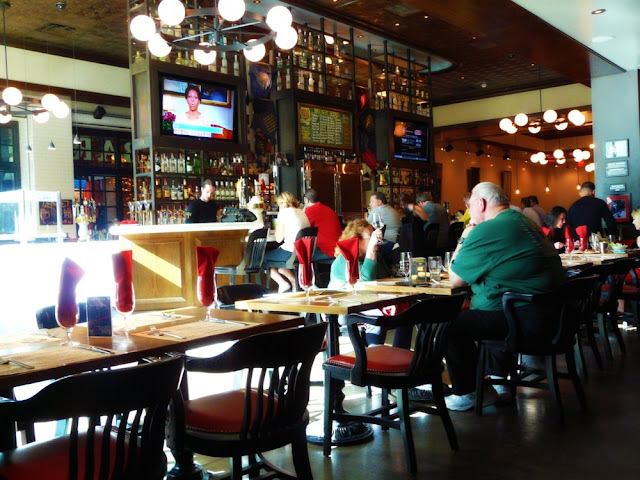 The decor is gorgeous, the wait staff were friendly and attentive, service was excellent and the dishes we ordered were delicious and totally hit the spot. If you're craving some decent Asian food while at the City Center in Vegas, give this place a try. 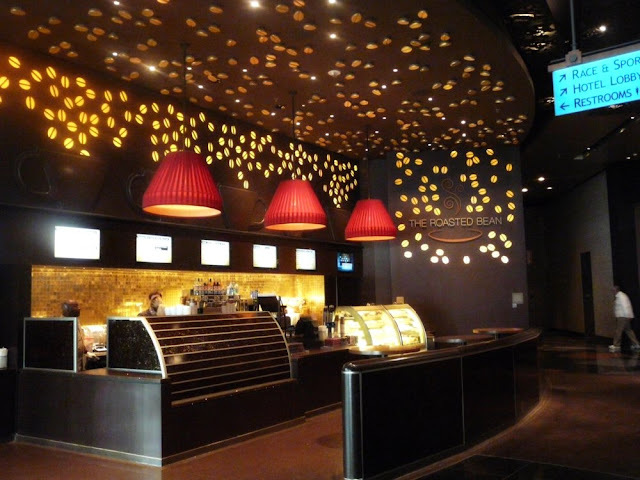 It's abit of a hidden gem, located in the back of the casino level. I love everything I saw and read in your post! My favorite restaurants are in Beccles Suffolk, and the energy of this place is very different from what I'm used to.